The purpose of this post is to illustrate the news customization of Bing News in Windows and how it can be paired with Windows Azure as a content source. 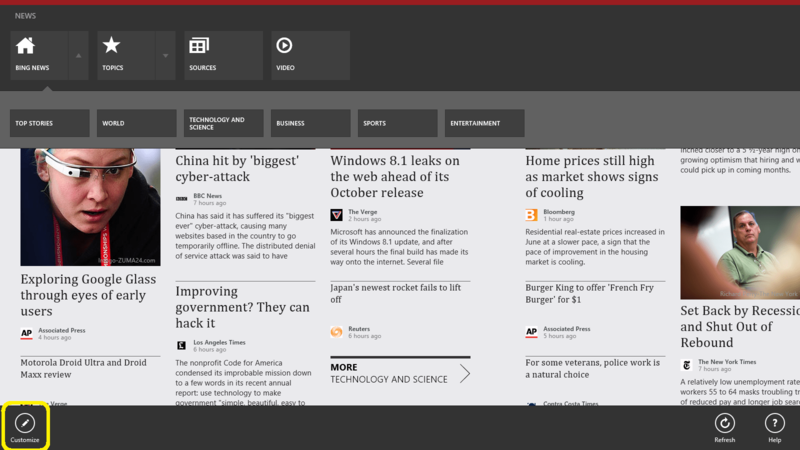 The result is a powerful aggregation of news sources personalized to me and available across my Windows 8 devices. Digital news come from a variety of sources and formats today spanning news companies to corporate bloggers and twitter feeds. With the proliferation of device options and application stores, we, the recipients of news often utilize a diverse set of readers ranging from web browsers to specialty purposed apps that are accessible across our devices. Prior to Windows 8, I used to have a list of URLs for my favorite news and blogging sites and combined them in mash-up on my.msn.com. It worked but it was a little bit of a clutter as my news feeds were intermixed with my stock feeds, sports scores, etc. What I really wanted was a single place with a single purpose for my various content, such as news. The Microsoft News application for Windows, aka Bing News, is one of these specialty purposed applications focused on aggregation and single pane presentation of news across data sources. Bing News comes with a standard set of news sources covering over a hundred (100) popular sources. This allows me to customize the presentation surface to only include the sources of interest to me. However, the data source options for Bing News does not end there, the Bing team provided an extensibility option to consume data from any RSS feed. It is this capability that opens Bing News up to aggregating data from more personalized news feeds, such as Blogs. I am now able to use a single News application to pull my own news sources together. To illustrate the RSS integration capabilities of Bing News, let’s start with a small example from a known data source. For example, at Microsoft several product groups have team and personal blogs as a means to communicate product information to the public audience. 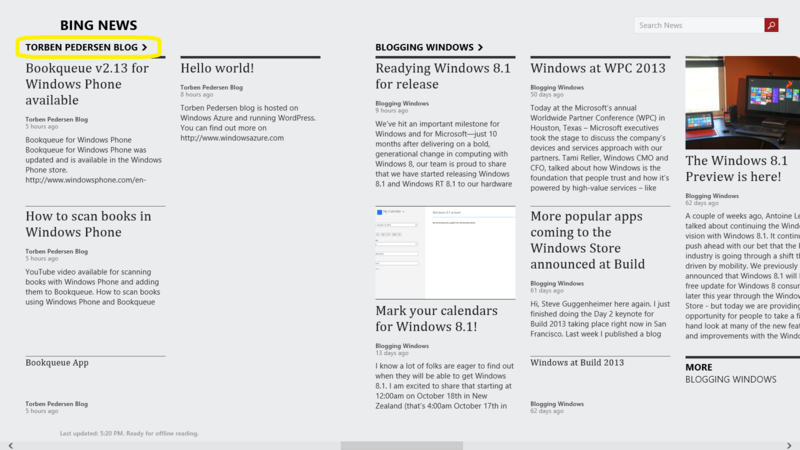 One of the team blogs that I subscribe to is from the Windows team and is called, Blogging Windows. 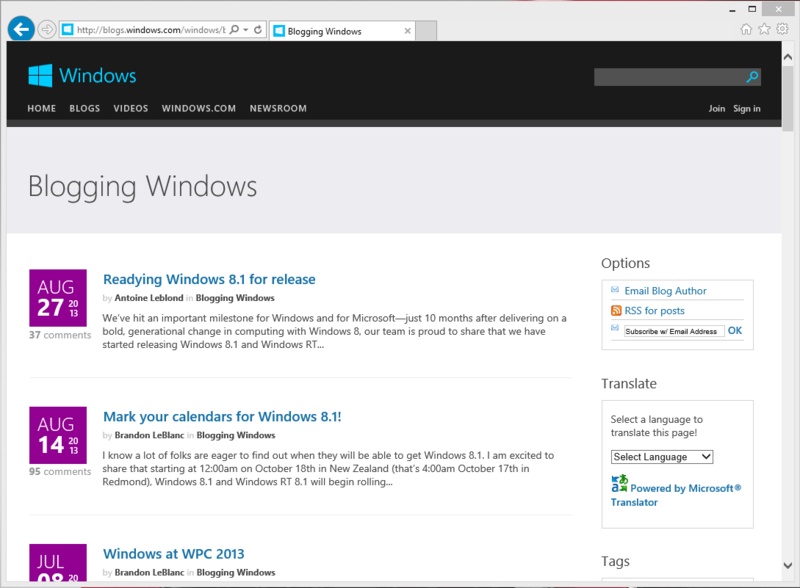 In order for me to read Blogging Windows along with my other daily news I can include the RSS feed link for Blogging Windows as a new Section in Bing News. 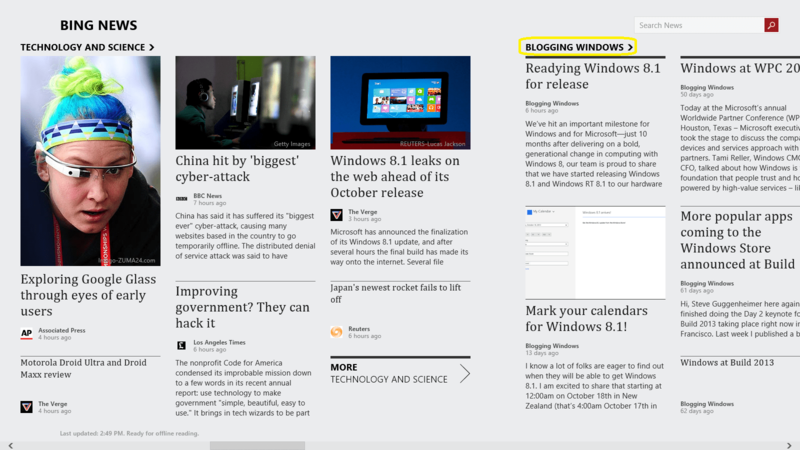 With the RSS feed URL copied to the clipboard, I turn to Bing News and customize it for a new section. Right-Click/Swipe Down from edge to get the Customize button in Bing News. 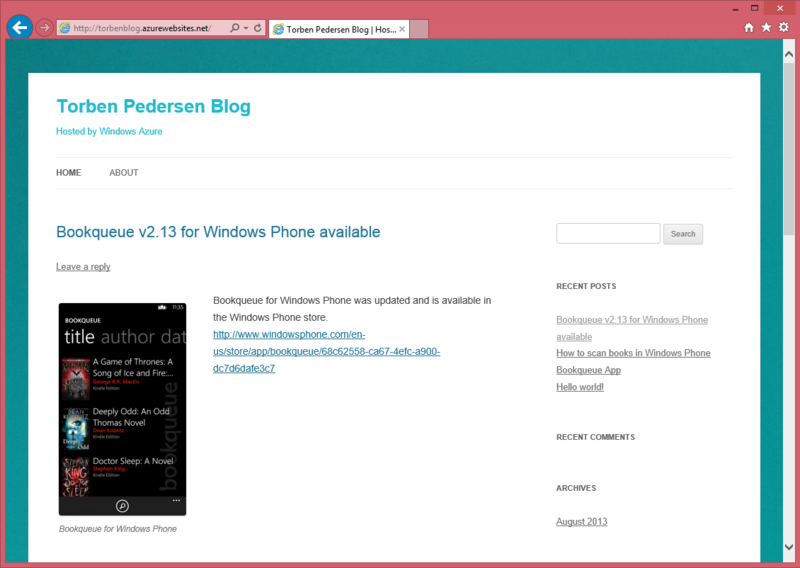 Blogging Windows RSS feed is now available in-lined with my other news sources. 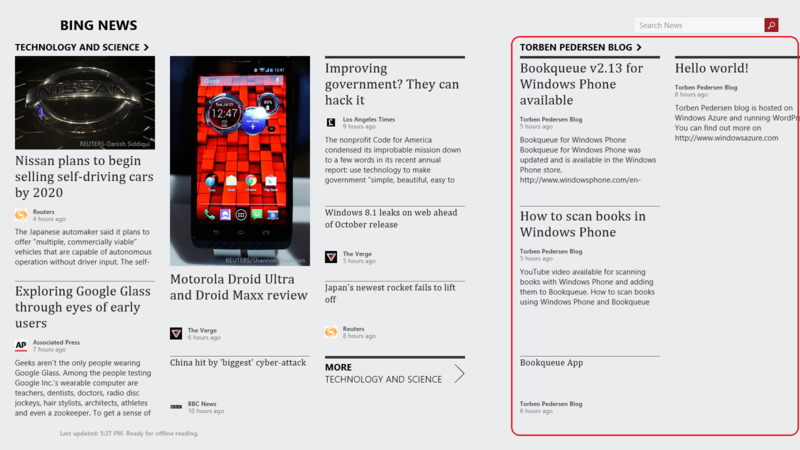 This works great as I now have a single view into my daily news interests. An additional benefit of Windows 8’s roaming settings, is that the customization I just made to Bing News on my laptop now follows my profile and shows the same news sources on my Windows tablets. There are many options available to satisfy these requirements, but for my needs I looked to a blogging platform that would fulfill all of these in one, WordPress. With that solution in mind, I also needed an infrastructure to host WordPress and looked to Windows Azure. Windows Azure is an open and flexible cloud platform that enables you to quickly build, deploy and manage applications across a global network of Microsoft-managed datacenters. One of the capabilities that exists in Windows Azure is a Gallery of website templates that allows users to quickly provision turn-key solutions, including WordPress. After having created my Azure account, I accessed the Windows Azure management portal to create a new web site. 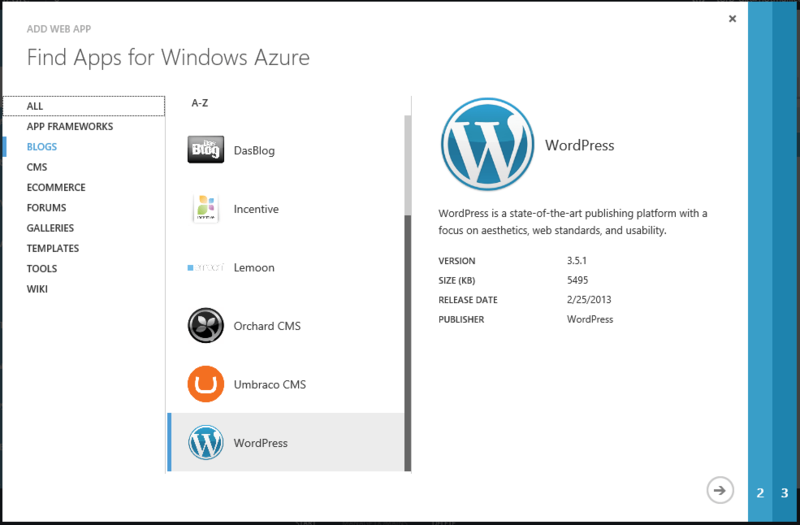 It took Azure about a minute to provision the web site and configure it with WordPress. 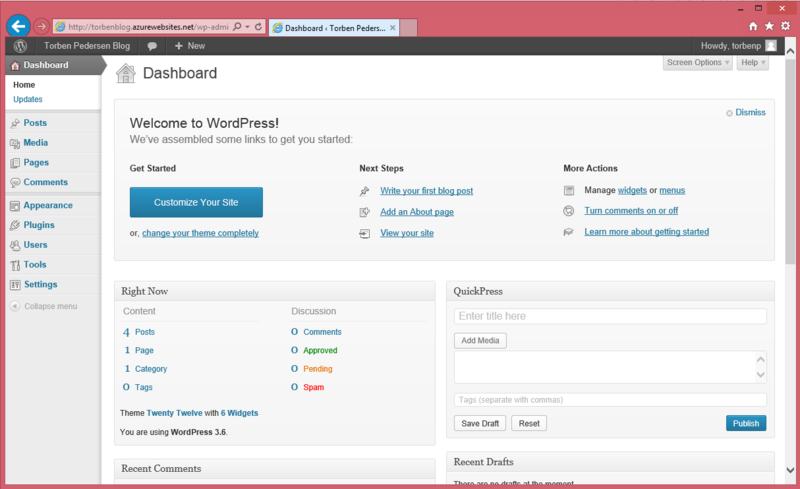 Once completed, I was able to browse the WordPress administration site and configure my blogging environment. I added a couple of blog entries for news samples. Once my blog was completed, I followed the similar process as above for getting Blogging Windows’ newsfeed into Bing News by locating the RSS URL for the blog entries and adding it as a new section to Bing News. Add Section to Bing News and Voila! To summarize, Bing News provides an extensible news reader that allows for a personalized News experiences across the content of interest to me. As a content provider, understanding the news reader capabilities also allowed me to easily distribute news to my readers by exposing my information from a RSS based repository such as WordPress hosted in Windows Azure. Hope this was helpful in creating your own personalized News experience.